Again leading implicitly to ... these kind of financial instruments are perfectly fine so lets start using them again. Instinctively these kind of arguments feel invalid. Can anyone perhaps use some more rigorous or formal type (logical?) analysis to demonstrate their validity/invalidity. Is that even possible? What I am interested in is an analysis of this particular form of argument using the tools of philosophy. When it was just used by the gun lobby it just seemed like a rhetorical tool. But it's now bleeding over to other areas so I'm interested in the form of that argument and it's validity. It's almost incidental that it's gun control. As an aside there is a really good podcast about the philosophy of gun control if anyone is interested in those particular issues. This line of argument is basically a strawman fallacy, which is when you construct a weaker version of your opponent's argument in order to then disprove it. In this case the weaker argument is that "guns kill people" all by themselves. No one actually believes that or argues that. Even the most committed gun control advocate acknowledges that firing a gun takes human intervention. The stronger argument being concealed by the strawman is "people with guns kill more people than do people without guns." It's also a black or white fallacy in that it is an attempt to frame the debate as two mutually exclusive choices, when other options may exist. You'll often find these two fallacies together, where the debater creates an artificially weak version of your position, and then tries to frame it as the only alternative to his or her position. IMPORTANT: The fact that this particular argument is fallacious does not mean we can therefore be justified in rejecting the conclusion the argument is intended to support (that in itself would be an argument from fallacy error), it just means we cannot take the argument as providing any actual support for the conclusion. To complement Chris' answer I'll try to deconstruct some of the reasoning in the arguments a bit. Guns are not responsible for killing people; people are responsible for killing people. Guns do not cause people to die; people cause people to die. But this second formulation is patently false - if people cause people to die [using guns] (which they do), then the guns they use cause people to die via bullets, which cause people to die via massive brain damage/haemorrhaging/etc. The only way we can claim that people cause other people to die without granting that guns cause other people to die is by rejecting transitivity of causation: that "A causes B" and "B causes C" does not imply "A causes C." Certainly there are some philosophers (especially within the free will debate, e.g. Carolina Sartorio) who reject transitivity, but definitely not within this context. Here, the only way the second statement can be true is if "PEOPLE cause GUNS" and "GUNS cause BULLETS" and "BULLETS cause DEATH" (some details left out, obviously), and from this we conclude "PEOPLE cause DEATH" but not "GUNS cause DEATH." This is a very strange thing to do - the only way we could conclude that people cause death is if we trace the process of causation through guns. Then we'd be forced to agree that guns, too, cause death. The only way out of this is some extremely arbitrary rule somehow excluding guns from being a cause of death while still being used to prove that humans cause death. Note that it is not a valid response to leave guns out of the causal chain altogether - it is undeniable that guns cause bullets to fly into living bodies and turn them into corpses. Thus we must return to the first interpretation, one of responsibility or agency. Simply, the argument is that guns don't kill people because they are not agents which can be held responsible for their actions. One does not charge a pistol with murder; one charges the human who used it to commit the homicide. This is a fair enough claim, but as Chris points out it is fallacious in being used to arrive at any sort of conclusion. It indeed constructs a strawman which claims those in favour of gun control somehow hold guns responsible for murder. Of course this is not in general true - if one uses firearms murder statistics as evidence in favour of gun control, they are roughly making the claim that the humans responsible for murder have access to weapons that can easily cause death. Then, by the only reasonable reading, "guns don't kill people, people kill people" is technically true but wholly irrelevant to the argument being made by gun control advocates. "Guns don't kill people; people kill people" is not an argument, it's a slogan. It may be the case that this slogan is just a way to get people to discuss the role of individual responsibility in what policies the government ought to adopt with respect to guns or something like that. Or perhaps it is just a signal that a person has some particular position that can be described in more detail if others are interested. I think interpreting it as an argument in its own right is not a good idea. Guns don't cause people to die; people cause people to die. In this formulation, there should be an obvious equivocation. On the one hand, guns most surely are the means through which some people do die. On the other hand, guns definitely do not have intention. The solution is that there are multiple types of causes (here I'm echoing Aristotle). There are on his view material causes, efficient causes, formal causes, and final causes. Aristotle defined the material cause as the matter through which something is effected, i.e. its the bullet going through someone's body that kills them. The efficient cause is the agent that intends the effect. This is the intentional shooter. The formal cause is the essence that maintains a thing as what it is (not applicable here). The final cause is the goal towards which the action was done. The agent wanted to kill someone because they were cheating on him. I take it that the point of the original statement is to deny that guns are involved in the reasons (final causes) that people die. This, however, might be non-responsive to the real claim being suggested by advocates of gun control. Gun control advocates may be making the claim instead that (1) guns can function as material means of killing = "guns kill people", (2) removing guns as a material means will make it harder to kill, therefore we should removes guns because "guns kill people." Conversely, gun freedom advocates are emphasizing a model of agency -- that what we should concern ourselves with is that people are the efficient causes and have the final causes. And that eliminating one means for them to kill does not necessarily remove their ability to kill. It's a classic liberal position in relation to negative freedoms. This is a black-or-white fallacy. While logically it checks out as true and is difficult to disagree with in real-time discussion; the intention is to frame the argument using an oversimplification of the context, and to the exclusion of other options. Such as excluding middle cases or alternatives. Also called false dilemma, fallacy of false alternative or excluded middle. "People with guns kill more people using guns than do people without guns." ... Until you see a chart like the one below. To quote Eddy Izzard: Guns don't kill people, people with guns kill people. The whole thing is a sophistry: A clever but wrong argument with the intent of deceiving people. First, it is a fact that guns do kill people. Just like leaking gas pipes, badly working brakes and so on kill people, so do guns kill people. Not very often, but often enough to make the statement "guns don't kill people" wrong. If we add cases where clumsy people with no intent of using a gun kill or hurt themselves or others by accident, that number is a lot higher. We can debate whether a gun that goes off while it is being cleaned counts as "guns kill people" or "people kill people". Second, it is much harder for people without guns to kill people. It is not impossible, but it is easy and requires no preparation to kill someone with a gun, while most other weapons make it a lot harder. Just try hiding on top of a view tower with a hammer in your hand or a bottle of poison and start killing people. It doesn't work. With a gun, it is a lot easier. Guns rarely kill people, but people with guns do quite often, and people with guns find it much easier to kill people than people without guns. When used in the argument in favor of gun control, the argument divides the world in a very black and white scenario: either a gun kills someone, or a person kills someone, with no gray scenarios in between. Any real life situation is not black and white, it's a complex situation full of preconditions and probabilities. So for the argument to be used in the situation of gun control, we'd need to know what is more dangerous overall: 1) a world with guns 2) a world without guns and of course, this is also a black and white scenario, but we'd have to view these as two ends of a spectrum of gun control (no control vs absolute control). Then we would have to decide whether it is easier in general to kill with the aid of a gun, or without the aid of a gun. We would have to oppose that also to using another inanimate aid regularly available. E.g. if it is equally easy to kill someone with a hammer, then hammers could be equated with guns, and they should follow all the same rules. This could be done for any object, whether inanimate or animate. Of course objects don't have motive, but we could say that a tsunami e.g. has 100% motive to kill you, since it is aimed at you and cannot be stopped or avoided easily. It is also very effective, but luckily not very available. I think the biggest flaw is the implied 'person without a gun'. Since we're used to saying something like this in an 'exclusive or' context, e.g. "I am not blind, I am deaf". In that sentence you're implicitly saying that blind people cannot be deaf. So it can be rephrased as A)"guns don't kill people, people without guns kill people". Unless it is meant as B) "guns don't kill people, people kill people with the use of guns". So the first thing in the argument is to ask the person which version they mean to communicate. To refute: A) prove that it's easier to kill people with the use of a gun than a non-regulated item, such as a hammer B) guns are still part of both equations, so by taking out guns we take out the loss of lives. Think about gun accidents, where people clean their gun and it accidentally kills their wife. Or a child playing with a gun, and it accidentally goes off. Or a bullet ricochets and hits an innocent bystander. So in all those cases, it wasn't the intention of the person to kill, but it still happened because of the existence of guns. To just take it one step further, and go completely reductio ad absurdum: if people kill people, then we should initiate people control instead of gun control in order to prevent killing. I think that's way more scary!!! A proper argument includes premises and a conclusion. Claims of the indicated form may be legitimate parts of a larger argument, most notably an argument that proposed regulations are poorly targeted at the problem they are supposedly intended to "solve", but does not really constitute an "argument" in and of itself. Arguments involving the use of such claims have varying degrees of validity, depending upon the causal relationships among the subjects of the claim and the regulations at issue. In most cases, a proper argument would require a claim with somewhat more detail than will fit into a soundbite, but the lack of such detail in the soundbite doesn't really mean anything. To really determine the validity of an argument, one must examine the argument itself, rather than just the "soundbite" version. So here the conclusion would be to restrict guns heavily as they are heavily restricted already in most Western countries. The argument is valid. The 'gun' is only a tool. Granted it's a tool for destroying things. And it's a common/popular tool for hurting/killing people (having been promoted by the videogame and film industries). But if you remove accessibility to that specific tool, people who want to hurt/kill people will find another tool. Maybe a more powerful one. If this was a legitimate argument, it would hold true even if 'guns' were replaced with a more virulent form of killing tool like 'cruise missile' or 'nuke'. Why do we bother trying to keep these 'weapons of mass destruction' out of the hands of the general public if it's only people that kill people not the weapons? If drones with lethal attack capability enter the market in the same way as guns have (it's unlikely), you will probably see an increase in that type of death as it makes it that much easier to kill someone if you don't even have to put yourself at risk. Yes, people kill people, with the most effective weapon to hand. Guns do not kill people insofar as they act alone. An action (typically an operator) is required. Bullets do not kill people either, they just sit there like stones. Analysis, or breaking down all the parts and taking a view of them individually, is how I reached this conclusion. Is "Guns don't kill people; people kill people" a good argument. Yes, insofar as good means efficacy. Right, lets do some arguing. On the face of it, it does seem silly; there is something of an implication here that only people act, and everything else is static. That is obviously not true. X will not do Y to an individual without the involvement of some external person(s). This is the form that is at the heart of the argument. And the test for its validity is will X do Y to an individual if someone external is not involved beyond setting up initial conditions. For many inanimate objects, this is certainly true; a gun by itself will not act upon anyone, for example. Neither will chairs, knifes, beach balls, etc. In order for these objects to do anything something else must initiate the action, and the most common culprit are other people. For animate objects, this could be false. A speeding car or a crashing wave both have the potential to do things to someone even with (maybe even especially with, in the case of a car) no one else involved. At this point, I will acknowledge that there is some give in the 'initial condition' statement. A car at rest is an inanimate object and not likely to leap out an hurt someone, and a bullet fired from a gun has become an animate object and increadibly dangerous without anyone's intervention. For institutiona practices and company policies, it is litterally imposible to remove the people from equation in the first place. This becomes the strawman arguement because policies without people cannot posibily be dangerous. But, policies always involve people. Someone has to implement the policies, after all. Bottom line is that this is a bit more case-by-case than Chris or Commando have asserted. When making the argument or the counter-argument you have to have a very go idea of what the X is, how X can do Y, and whether or not X needs someone else to do Y. When Chinese first discovered gunpowder, they used it for centuries only in the production of fireworks. Weapons needed skill to be used, and this alone probably avoided major violence. What your "argument" says is that only p1 matters. 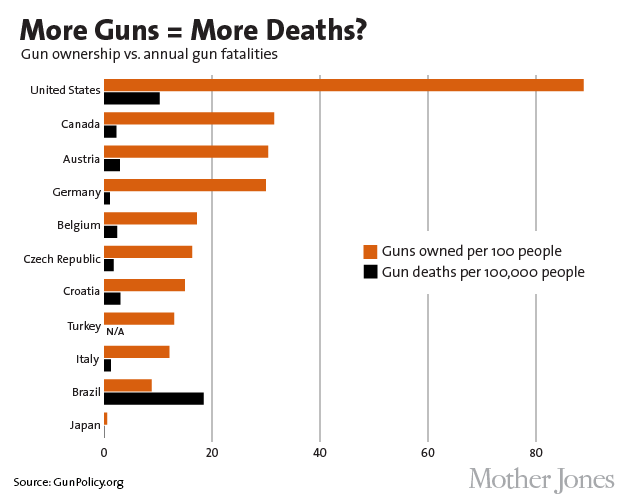 But of course the number of fire guns is directly related with p2, thus with the number of deaths. The arguments are valid, however there is some instrumentation in their use in order to divert attention and to blur the issue. The problem comes down to a matter of intentionality. The fact that "X not <action> Y", does not exempt X as indirect cause of "<action> Y" or "<action> Z" and therefore does not invalidate a reflection on the use that Y makes of X. In conclusion: It is not the logic of the arguments that makes feel them as not valid, but is the use people make of the arguments which can vitiate them. In basic logic, if an argument contains a self-contradictory premise, how come the argument is valid?